This article discusses coach Lance Randall's Anchors Zone Offense and his two excellent DVDs on the subject. Coach Randall at this writing is head men's coach at Saint Leo University in Saint Leo, FL. 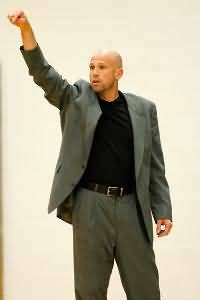 He has also coached at Wisconsin - Stevens Point (Div III) and at nearly every level, including NBA, European professional, Division I, Division III and high school. These two excellent DVDs, are a must for any coach wanting to use the Anchors zone offense. In his first DVD "Zone Offense Concepts", Coach Randall first discusses some general principles, introduces the anchors zone defense, and provides a number of key breakdown drills for teaching the offense. Get a shot every possession. Shot selection, getting a good shot. You have to know your team, who your best shooters are, and players have to know their roles (whether a shooter or not). Get to the free-throw line. Get defensive stops and rebounds. Whether you use pressure defense, or a packline sagging-type defense, or a combination of both, you must get stops and rebounds. Importance of good transition defense... no easy lay-ups in transition. Conditioning - know how far you can push your team. Team chemistry - "don't let your buddy down". Keep it simple - decide what you want to be really good at. Coach Randall believes that a lot of zone offenses use wasted energy, wasted cuts and action, as cutters often do not get the pass, or get it in an uncomfortable place between defenders. You must use different passing angles in attacking zone defenses. You must also distort the zone and not just rely on ball-reversal. You must stretch defenders to the limits or their coverage zones, which, in addition to stretching the zone coverage, creates confusion between the defenders as to who is actually covering the ball. 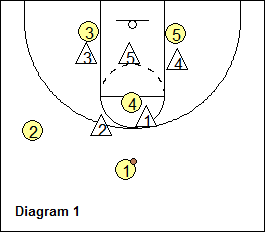 Many zone offenses end up their possessions with 3-point shots. This is just what the defense wants, especially if your shooting is off. You must get the ball inside for easy baskets and free-throws. Coach Randall introduces the concept of "anchors" where defenders are "anchored", or boxed-out away from the middle, by our post players. These are "posting up" moves on the outside, where the post player contacts the defender, reverse pivots and seals (boxes out) the defender away from the middle... just as a post player would do inside to get position on a defender. It's a "block-out and post" technique. These block-outs will open inside passing and dribbling lanes. 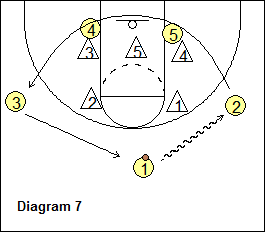 In this first DVD, Coach Randall shows a 2-1-2 set, whereas in the second DVD, he goes to a 3-out, 2-in set (see below). Diagram 1 shows the 2-1-2 set with two guards, O4 at the high post, and O3 and O5 on the low blocks. O4, O3 and O5 are our anchors. We offset with O2 on the left wing. 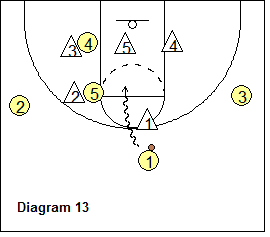 O1 engages the X2 defender and passes to O2 who is at or below the free-throw line extended. This causes X3 to "lift" and close out on O2 (diagram 2). O2 then passes back to O1 (diagram 3) as O3 anchors (boxes-out) the X3 defender, and O4 anchors the X2 defender. 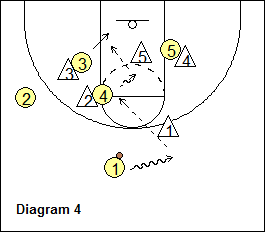 O1 dribbles right (diagram 4) and often O4 will be open for the pass from O1. O4 could attack and shoot, or perhaps dump it inside to O3 who has posted up the X3 defender. Coach Randall discusses here how it is often uncomfortable for O4 to catch the ball at the high post. To make this easier, he usually has O1 and O2 cut below the free-throw line extended, so that now O4 can see all four of his teammates when he catches the ball and faces the basket. We always want O4 to catch, "rip" and face the basket strongly. Diagram 5 shows another option here. O2 can cut to the top and get the pass from O1. O2 attacks a wide open lane created by O4's anchor. O5 also anchors the X4 defender for inside position. Diagram 6 reviews the possible anchor spots. O4 can anchor either top defender near or outside the elbow, while O3 and O5 can anchor the outside low defenders whenever those defenders have to move outside to defend a perimeter player. Coach Randall describes these anchors as "legal illegal screens"... our screeners are not stationary per se since they reverse pivot and seal, but like any inside post-up, do they have the right to post-up and seal for inside position. 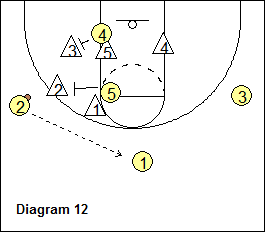 Next, Coach Randall discusses attacking 1-3-1 and 1-2-2 zones (more below in DVD #2). Unique to this DVD are the many essential break-down drills (not discussed here). These include drills for anchoring, drills for our high post player (including catching, passing and finishing), drills for our guards, and inside low post toughness drills. You need to get the DVD for all these important drills. DVD #2. In his second DVD "Anchors Continuity Zone Offense", Coach Randall goes into the details of the offense vs 2-3, 1-3-1 and 1-2-2 zone defenses. 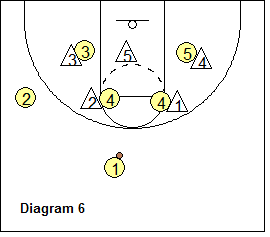 Why use the Anchors Continuity Zone Offense? Zones create problems with passing angles and timing. 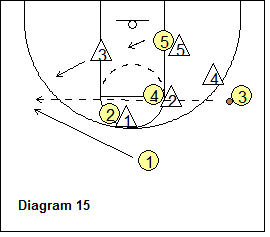 Anchors create open inside passing lanes. Anchors create sedentary passing targets. An anchors can take away a defender from the line of the ball. Sealing the defender opens up the passing lane. Anchors help you get the ball inside. Anchoring naturally results in great offensive rebounding positioning, and important easy second shots. As the perimeter defensive players struggle to get around the anchor, this often results in natural screens for our guards. Anchors are "legal illegal screens". 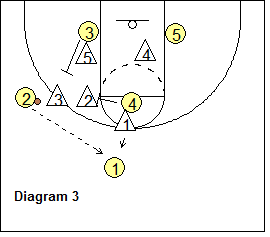 In this second DVD, Coach Randall goes to a 3-out, 2-in set vs the 2-3 zone. There are two possible entries after O1 dribbles to either wing. The wing can either (1) "long cut" through to the opposite wing, or (2) "shallow cut" to replace O1 at the top. Diagram 7 shows O1 dribbling at O2. O2 long cuts through to the opposite wing, as O3 rotates up to the top. Diagram 8 shows the shallow cut option as O1 dribbles to the wing, O2 cuts inside and out to the top to replace O1 as O3 stays. 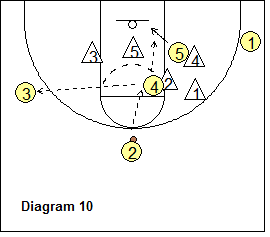 We want O1 to dribble to just below the free-throw line extended in order to stretch the zone. This gets X1 to move with O1, and X4 has to start thinking about having to move out. In our zone attack, we always want to try to stretch the zone by taking a defensive player (here X1) to limits of his coverage area (or to the "exchange point" where X1 and X4 exchange). With ball movement to the wing, the opposite low post O4 flashes to the ball-side elbow (diagram 9). This pass is not often open as X2 denies this pass. But O4 can anchor the X2 defender. O4 should get a little below the block, as this will make it easier to take X2 away from the ball on the next pass. So now O1 passes back to the top to O2, and then O1 slides down to the corner area. O4 anchors the X2 defender, and O5 anchors the low outside defender X4. 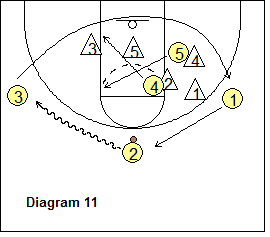 O2 could pass to O4 sealing (diagram 10), and O4 looks to score, or might pass to O5 who has anchored the X4 defender, or to O3 spotting up for an open 3-pointer. If O4 is not open, O2 dribbles to the left wing (diagram 11), and O3 cuts through to the right wing, with O1 rotating to the top. Note that O3 could have also used the shallow cut option to the top, leaving O1 on the right wing. As the ball goes to the left wing, the post players "X-cut" with the high post player O4 diving to the ballside block first, followed by the opposite low post O5 cutting to the ballside elbow. The high post player always cuts first. 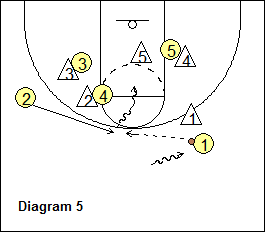 Some coaches prefer not to X-cut, but rather just have O4 and O5 slide across the lane to the ballside, with O4 always staying high and O5 always staying low. Coach Randall likes the X-cut. O2 passes back to O1 (diagram 12). Notice that O5 anchors X2 and O4 anchors X3. Diagram 13 shows that O1, rather than passing to O5, might dribble-drive around X1 into the open lane. O4 and O3 might be open for passes. Flare-screen. Whenever we pass the ball to either wing, we can flare-screen. Diagram 14 shows O1 passing to O3 on the right wing. 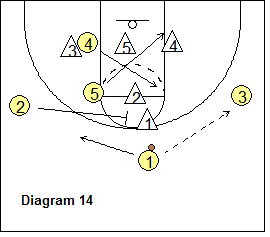 The post players make their X-cuts, while O2 flare-screens (back-screens) the top defender X1, and O4 and O5 anchor X2 and X5 respectively (diagram 15). O1 cuts over the screen to the left wing and might be open for the skip-pass from O3. Get the rest of the Anchors Zone Offense article in the Premium Members section and the Playbook download. 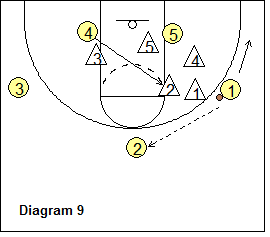 vs 2-3 Zone - "Celtic screen"
vs 2-3 Zone - "Banana Splits"
vs 2-3 Zone - "Texas Hold 'Em"
In summary, the Anchors zone offense should help you get the ball inside against zones for easier inside shots and more free-throws, and should help you get more offensive rebounds and put-backs. Also, I ask myself the question that if using anchors helps against zones, wouldn't teaching the anchor concepts also make my post players better vs man-to-man defenses? I think they would naturally become better at posting up and sealing defenders for inside positon. Which DVD should I buy? 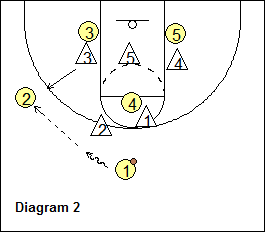 If you are on a limited budget, get the second DVD "Anchors Continuity Zone Offense", as this contains the real "guts" of the 2-3, 1-3-1 and 1-2-2 zone offenses. However, even better would be to get both DVDs, as the first DVD "Zone Offense Concepts" sets the groundwork and contains the necessary break-down drills.